Templates 1-2-3 Comes With 19 Ready Made Mini-Site Templates and a How-To book on making your own fresh templates! Are you sick and tired of forking over your Hard-Earned money each and every time you want to build a mini site? As a MiniSite Designer, I understand just how important it is for your minisite to look professional. A poorly designed site can cost you sales and hurt your business. But the fact is, depending on custom designs can be expensive and time consuming. Not everyone can afford to fork over $100....$200....$300...or sometimes as much as $500 for a minisite with a professional look. Sure...the big "guru's" can fork over the cash, but what about the "little guy" just trying to get his minisite online? Or what about someone who just wants a nice minisite for the free or low-cost report they are offering...??? Does it make sense for them to shell out big bucks to a designer for each and every minisite they need? And what about the marketer in a pinch for time...? Anyone who's dealt with designers in the past knows that they are ALWAYS behind schedule! "I've Leveled the Playing Field!!!" What I've tried to do with this MiniSite Templates Pack is to make things easier for YOU! First off, Minsite Templates Pack comes with a set of 10 Professionally-designed MiniSite templates. Each template has it's own unique design and feel to it...but is also easily editable. One of the biggest problems with templates you buy is that you aren't able to adjust them to fit your needs. My GOAL with this package was to make that as easy as possible! Each template comes coded in fast-loading and search-engine friendly CSS...PLUS you get the PSD files for each template to make editing them in Photoshop or GIMP extremely simple and easy. Also included in MiniSite Templates Pack is a collection of templates I like to call "Plug-n-Play" templates. The basic design and layout is right there for you - all you need to do is change some text and add an image and you're ready to roll! As a matter of fact, the very MiniSite you are reading right now was created from one of these "Plug-n-Play" templates in a matter of MINUTES! "No paying big bucks for a designer.....no waiting for the site to be finished....no trying to design your own site only to have it end up looking awful..."
There are 9 different "Plug-n-Play" template colors to choose from. Just change the text in the header and footer, then cut and paste an image or graphic into the template and...BOOM! You've got a unique minisite you can call your own...and it only took you a couple of minutes! "But I Don't Know How to Make My Template Unique!" This is where the third and final part of this package comes into play. What I've done to SOLVE this problem is put together a report I've titled "Templates 1-2-3". 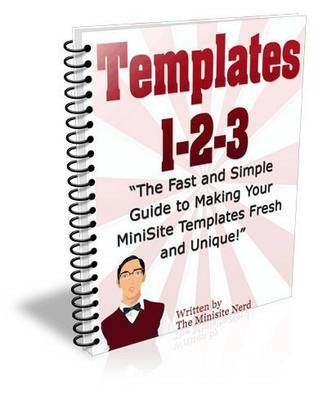 "Templates 1-2-3" is a valuable resource guide that will show you how to easily turn templates that you buy, like the ones in this Minisite Templates Pack, into professional-looking, unique templates that stand out. You'll learn where you can find everything you need to start turning the minisite templates you own into one-of-a-kind sites...with personality! These are the very same resources I use when creating minisites for clients....and now you will have them at your fingertips whenever you need them! Even if you use just ONE of these templates for just ONE of your MiniSites...this Template Pack will SAVE you money! And that's not even taking into account the value contained just in the "Templates 1-2-3" report...which is easily worth more than what you'll pay for this entire package.